Our seasoned renovation teams possess the skill and experience to provide complete, one stop renovation capabilities from the ground up. Our services include both residential and commercial renovations ranging from simple one room remodeling to a complete “gut” and renovation of an existing property. If your project requires carpentry(rough and finish), plumbing, drywalls, electrical, heating and cooling, painting, flooring, cabinetry, or appliances, our team members have the skills to deliver a quality finished product. As an FHA 203K Contractor, we have the knowledge and experience to work seamlessly with new homeowners and their construction lenders including FHA 203K lenders. Complete interior renovation of a three flat on the north side of Chicago involving a gut and rebuild of the kitchens, refinishing and repairing wood flooring, patching and painting of the entire interior, new doors and new trim throughout, and bathroom updates. Complete interior update and renovation of a 5,000 square foot home in the northwest suburbs. Renovation and repairs of vandalized properties in Chicago. Complete interior update and renovation of a 2,500 square foot home in the south suburbs. As a licensed general contractor in Chicago as well as in a number of other surrounding communities no job is too big or too small. 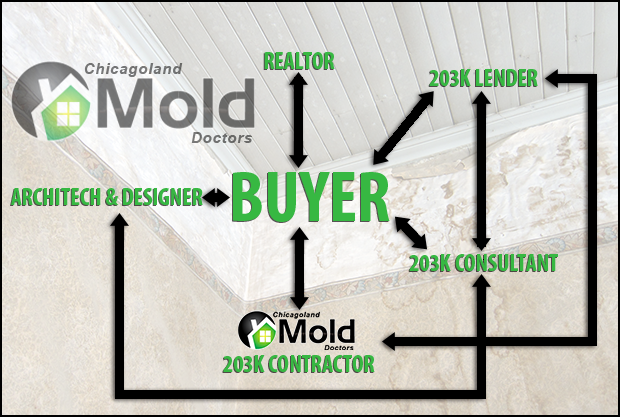 CMD has worked with buyers, borrowers, lenders, and real estate agents who are in need of an FHA 203K Contractor. We thoroughly understand the entire process and work directly with FHA 203K lenders and consultants. An FHA 203K loan is the only permanent mortgage loan that permits a buyer to acquire a home that doesn’t meet minimum HUD guidelines and provides funds for post purchase renovations. The purchaser/borrower only has to qualify for one loan which will cover both the purchase prices plus renovations. This is not only simpler than obtaining two separate loans but also eliminates the chance a purchaser/borrower will have difficulty securing a long-term mortgage once the renovation is complete. As an FHA 203K contractor CMD will create the perfect space for you. We will support you throughout the entire process. Our team of skilled craftsman, sub-contractors will turn your new or existing home into your dream home. If you want to work with a professional contractor experienced in working with FHA 203K lenders and consultants, CMD is your solution.